Oh my gosh … look at that sunset! Ja, hardly a “resort”, hey? Anyhoo … glad you aren’t being blown away today! @JustBcoz – Resort (not). It is all rather shabby hey? 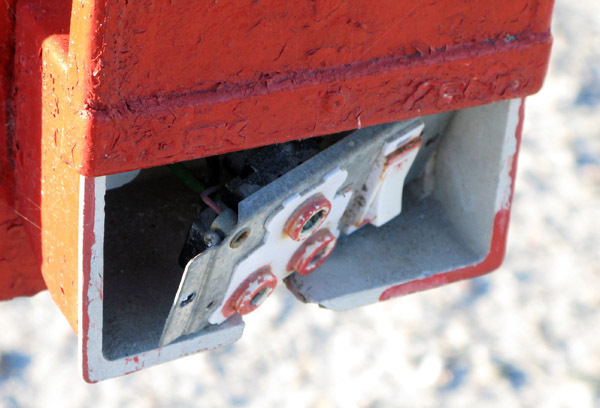 I wouldn’t like to think what would happen if you used an electrical connection that looked like that!! Great post and sunset photo by the way. Hi Tom that is called a one time plug point. Use it and your dead one time. We just had a fab 14 days at this “resort”! 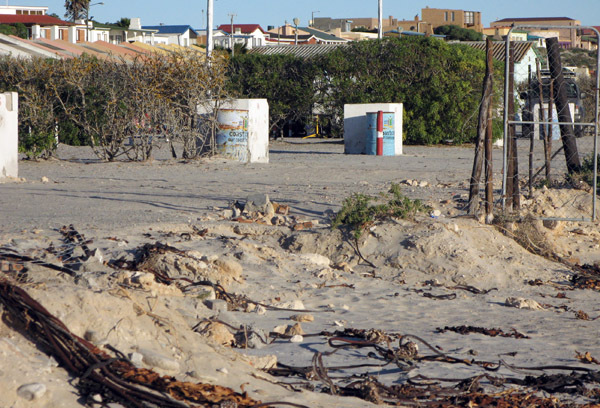 I think the reason for the broken fence was because of the high seawater level during 2009 (same time when the sea was very rough in Seapoint). They’ve put up new fences but are still buzy to fill up the gaps were the sea took away the sand as well as braai’s. Some sites have new braai’s. 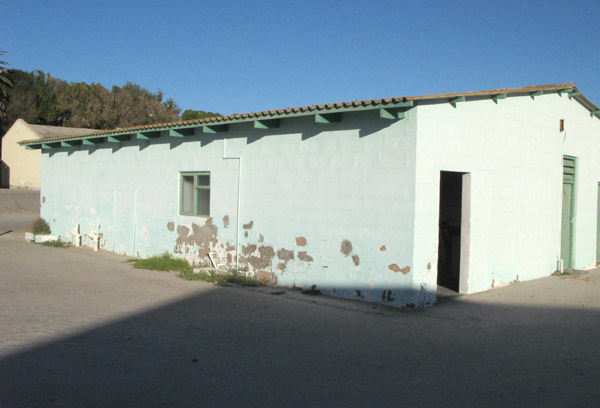 The entrance to the camp was upgraded and the during the December holidays there were always people at the gate. Each vehicle also received a sticker to enter the camp. 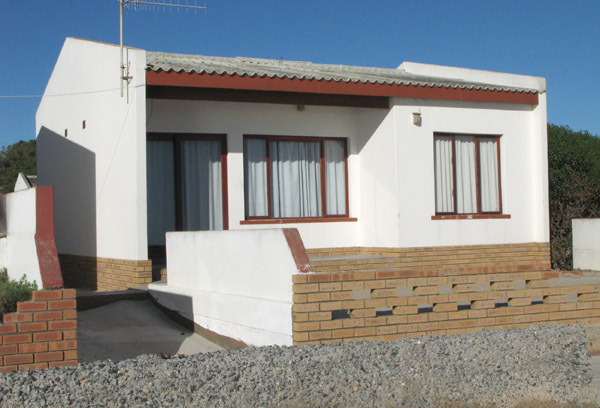 The accommodation which you can see on your security gate photo was also painted and in the front of each house is a newly build “stoep” and braai. Wish I could send you some pics! Hi Camper – Glad to hear that they have done some upgrading since I was there. Maybe some of it is because of what has been said and written about the place. So many people I spoke to and asked if they would stay there said no way!! That fence got taken out in 2008 and nothing was done about it. The worst part about that was the continuous stream of beggars coming off the beach. You dont mention the ablution block as I foun those pretty awful as well. 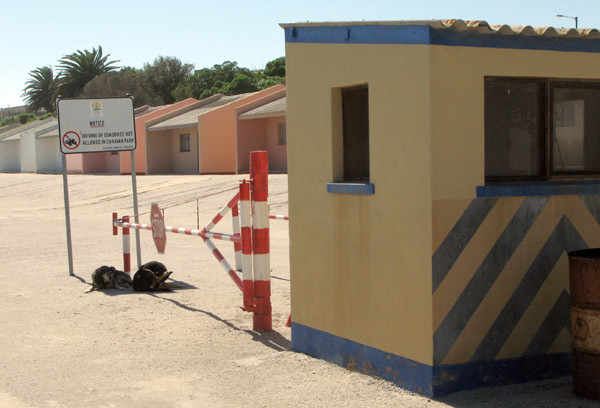 Hi – I can’t comment on the specific ablution block, cause we’ve been using the ablution on the other side of the camp. We had hot water and the ablution was cleaned on a daily basis. Glad to hear you were happy. I, and many others that I spoke to, was not that impressed although there was always hot water available. Hi we spend 10 most wonderfull days at the caravan park over christmas 2009 and yes it is not at all luxury but it was wonderfull. When something broke they fixed it, there was security at all time at the gate, warm water and the bathrooms and toilets was clean at all time. Hi Engela – sounds as if things have improved since I was there. I hope so as the park has great potential and with that view should have a lot of people staying there all year round. Hi. Is it safe to stay there out of season? I think if one is reasonably aware it should be fine. I stayed there for 2 weeks out of season and apart from the beggars it was fine. Ive been to that campsite every December for the last five years and I can garentee you its not as bad as the pics show you.The security is great and the owners always friendly.Cant wait to go on 12 days. Hi Chris – Glad you enjoy the park. It is strange that the first thing i was told’ on arrival, was to make sure not to leave anything outside if I was not there as people just walk off the beach and take your stuff. Happened to someone while I was there. I think that the position of the park is one of the best on the SA coastline and if they would upgrade some of the facilities it would be great. Enjoy your stay. please can someone tell me where i can find great accomodation in mcdougals bay? Razina, contact Beverley Jackson at Seef Properties when you get in to town. She’s an institution at McDougalls and has quite a portfolio of rentals available. 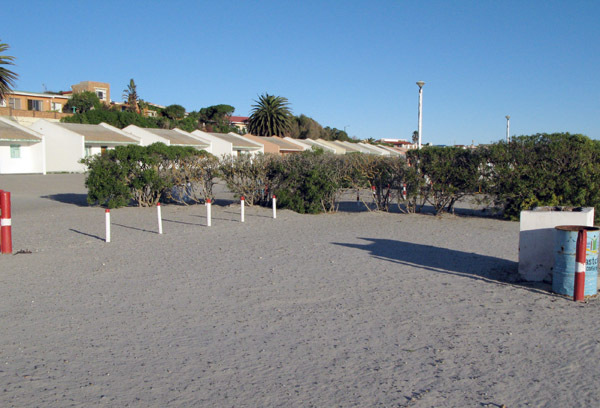 Visit the resort in August 2011, yes like all camping resorts there are areas of improvement. All over the country money for repairs and maintenance are channeled to other areas. Yes the buildings need paint more regularly because it is subjected to sea weather and wet climate. But it was cleaned at all times. But for the experience it was worth it, this trip was nostalgic! 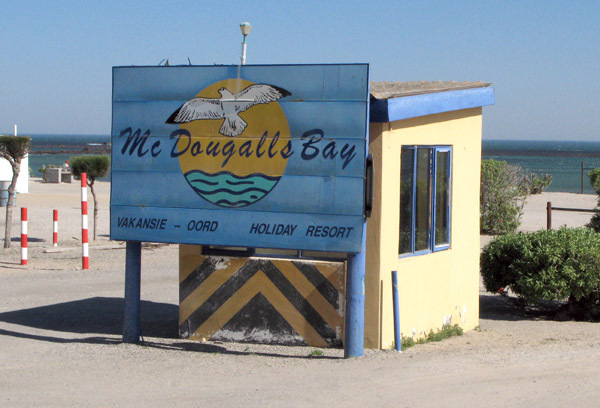 Experience my first visit to Mcdougals bay in 1988, the camping area was not established. Booked for a week in the chalets, 23 years later experience the camping trip through Northern Cape and use the camping facilities. Going back next year!! Hi Anneline and thanks for the update. Glad to hear there have been a few improvements to the park. Hi, I am looking for a campsite that allows dogs on the West Coast. 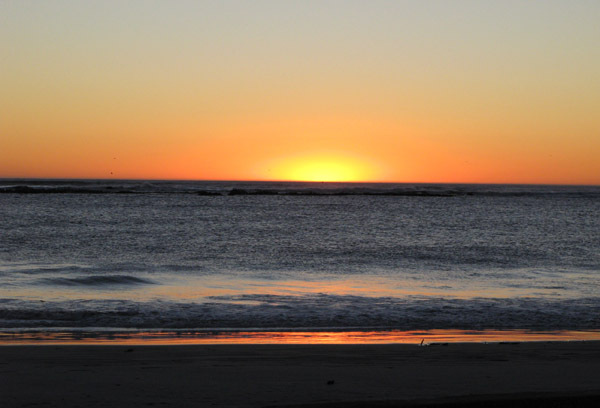 My plan is to travel from Gauteng to the West Coast(Mcdougals bay sounds fine) from mid January 2012 to beginning February 2012. I will be camping all the way with my Rottweiler. Any suggestions on other accomodation in the West Coast vicinity? Ek wil weet waar kry mens die adres van die chalets op die foto’s hierbo. Ons gaan in Feb 2012 op ‘n toer en wil graag in McDougalls baai bly – of het iemand ‘n beter, bekostigbare plek aan te beveel? Hi there, does anyone please have the daily rates for the camp (tent) sites? Hallo ek soek ASB julle selfoon of tellefoon nommer?